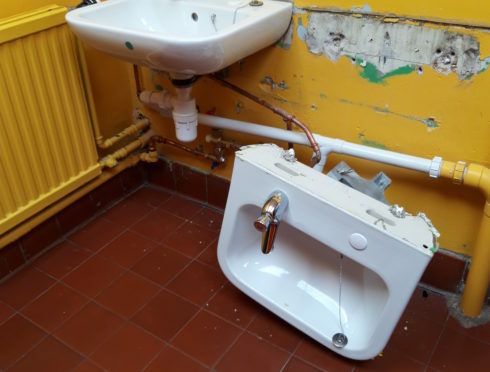 The fallen sink saw the boys’ toilets in Broadford primary closed for several days, and adds to a catalogue of concerns the community has about the state of the school. They say the walls are running with damp, there are slug trails everywhere, the roof has cost the council thousands in repairs and asbestos was found in the kitchen last September. Broadford Primary Parent Council (BPPC) has been pushing for a new school for years. BPCC member Norma Morrison said: “With the community council we have continually expressed concerns about the health and well being of staff and pupils working and learning in such poor conditions. Meanwhile Broadford and Strath Community Company have set up a working group chaired by the Broadford and Strath Community Council to co-ordinate engagement with Highland Council to push for a new school. Community council chairman and chairman of the working group, Hamish Fraser said: “Broadford Primary is a totally unsuitable and unsafe learning environment that has been highlighted many times over the years. “The community are aware that funding from Scotland’s Learning Estate Strategy which supersedes the Scottish Government’s Scottish Futures Trust is the best and maybe only hope of securing a new school for Broadford. “This awareness has given the community time to work together to build a strong case for a community school. Skye and Raasay councillor John Finlayson is the current chairman of the council’s Care, Learning and Housing committee. Kate Forbes MSP said: “When I first met the parent council over a year ago they were very downbeat and in despair about the state of the school but in the last year have started working together to bring together plans for a new school.